Was Cameron robbed by non-goal decision? The Lions' tally of 61 points generated from turnovers was their fourthhighest of the season. They were only outscored by six points via that source, their fourth-best result of the year. The Giants kick backto-back scores of 100-plus points for the first time this season. They were led magnificently by Josh Kelly who had a team-high 30 disposals to go with two goals and two score assists. 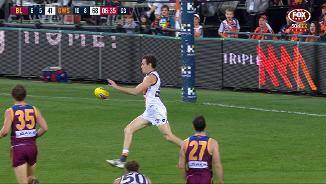 Luke Hodge kicks his first goal as a Brisbane Lion. He has been best afield for the Lions with an equal gamehigh 30 disposals. Jeremy Cameron and Jonathon Patton have taken seven marks between them inside the forward 50. 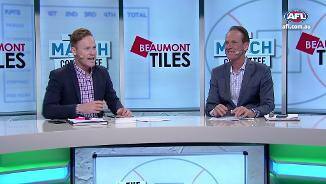 Brisbane has taken eight marks in that zone as a collective group. Allen Christensen becomes Brisbane's second player to kick multiple goals for the match. Its tally of 69 points for the match is currently its fifthlowest in any game this year. The Giants are finishing full of running, generating six of the past seven inside 50s of the game. They are in the box seat to win their sixth match in a row against the Lions. The ground balls have been a strength for the Lions all season, losing the groundballgets just twice. They lead that count by 19 which would be their fourth-best result of the season. Giants InterchangeDawson Simpson off due to an injury. Eric Hipwood had a seasonlow five disposals in his last match in Round 12 against Essendon. He has managed just eight disposals this evening to go with two goals and two marks inside 50. 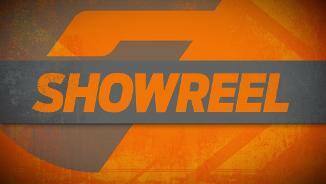 The Giants generate their seventh goal of the match via a Brisbane turnover. They have outscored the Lions by 12 points via that source. Allen Christensen kicks his first goal of the match and his eighth of the season. 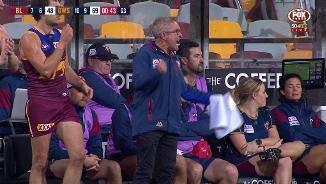 He has now kicked 5.3 from set shots as the Lions kick their fourth goal in a row. Brisbane has generated 4.0 (24) from defensive 50 chains. Luke Hodge has been instrumental for the Lions, winning 10 of an equal teamhigh 23 disposals in the defensive 50. The Giants have only lost once this season when leading at three quarter time. They lead the inside 50s by three and have generated six more scoring shots for the match. The Lions are taking it right up to the Giants, generating the last five inside 50s for the term. They have now kicked three goals in a row for the first time this match. The Lions have kicked backto-back goals for the first time in the match since the opening term. They have been more accurate in the term, kicking 2.1 (13) to the Giants' 2.4 (16). Brisbane's shooting at goal has been errant, recording six missed shots at goal to Greater Western Sydney's two. It has kicked 3.2 from set shots compared to the Giants' 6.4 via that source. Harry Himmelberg grabs his second mark inside 50 for the match. The Giants lead marks inside 50 114 with Jonathon Patton's three marks in that zone a game-high. The Giants have been dominant from throw in stoppages, generating 4.0 (24) to the Lions' 0.2 (2). They have outscored the Lions by 18 points from all clearance chains. Jonathon Patton kicks his second goal of the match to open up a matchhigh lead of 36 points. 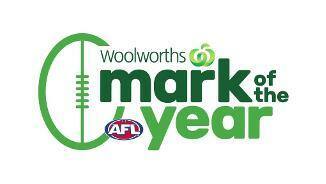 It's the first time he has kicked multiple goals since Round 1 against Western Bulldogs. Luke Hodge will be looking to build on what was his most productive first half of the season, gathering 17 disposals, five more than in any other match this year. Only Dayne Beams (18) and Daniel Rich (19) have had more disposals for the Lions. The Giants are marginally ahead in the clearances (1816). But they have been a lot more productive via that source, scoring 3.1 (19) compared to the Lions' 1.2 (8). Brisbane enters the half time break with a 24point deficit despite controlling most of the key measures in the second term, winning the disposals by 26, uncontested possessions by 29 and effective kicks by 11. At the same stage in 2017, Jonathon Patton had 18 goals from 10 games. He has just six goals after 10 matches this season as he kicks his first goal of the match. The Giants have now kicked four of the past five goals of the game to open up a 12point lead. They lead the inside 50s eight to four in the past 10 minutes. Contested ball has been an area of concern all season for the Lions, losing the count by eight per game, ranked 16th in the competition. They are negative four in that measure for the match. Brisbane has generated just three behinds from chains originating in the attacking half of the ground. Greater Western Sydney has scored 4.1 (25) from chains launched in that zone. The Lions are providing all the attack so far in the second term. It has kicked 1.1 (7) and kept the Giants scoreless. They lead time in forward half 66 per cent to 34 per cent for the quarter. Eric Hipwood has already been the the direct target inside 50 on five occasions, a gamehigh. He is the only player on the ground to take more than one mark in that zone (two). Brisbane remain the only team in the competition yet to win an opening term. It broke even with the Giants for inside 50s (15 apiece) and had seven more disposals and seven more uncontested possessions. The Giants' opening term score of 32 points is their highest for the season. It eclipses their 26 points against Western Bulldogs in the season opener. Jonathon Patton is the only player on the ground yet to record one disposal. He has struggled to impact the match early and has been the direct target inside 50 twice. Josh Kelly has picked up from where he left of before the Giants' bye in Round 13. He had 40 disposals in Round 12 and already has nine disposals and one goal to his name. Brisbane is on top in several key measures, leading disposals by 18 and uncontested possessions by 23. It has also hit the target by foot 22 per cent more often than Greater Western Sydney. The Lions have kicked two goals from their two disposals inside the forward 50. Likewise, the Giants have also booted two goals and had eight disposals in that zone. Sam Reid is the only player on the ground with more than one disposal inside 50 (two). Lions InterchangeHarris Andrews and is possibly out for the game. Eric Hipwood boots his fourth goal of the season in the opening term. Brisbane is matching the Giants in the contested ball early, leading the count 1312. Dayne Zorko kicks the Lions' first goal of the match and his seventh from a set shot this season. They narrowly lead the inside 50s 43 early in the first term. Greater Western Sydney has won the groundballgets by 12 per game this season, the biggest differential of any side in the league. Since Round 9, Brisbane has scored from 48 per cent of its inside 50 entries, the thirdhighest percentage of any side in the competition. Welcome to Gabba for the Brisbane Lions v GWS Giants Round 14 clash. 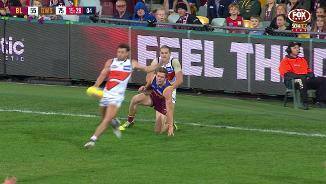 GREATER Western Sydney's win against Brisbane has been overshadowed by a shocking Jeremy Cameron elbow on Harris Andrews that is likely to see the star forward cop a lengthy suspension. The Giants moved to within half-a-win of eighth with their 16.13 (109) to 12.10 (82) victory, but Cameron's first quarter shocker could have larger ramifications. 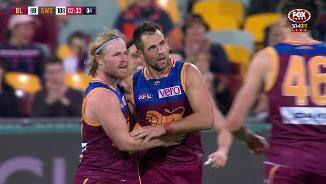 Cameron raised his elbow in a marking contest, making contact with Andrews' face while the Lions vice-captain was trying to spoil. Andrews crashed to the ground concussed with blood streaming from his mouth and barely moved before being stretchered off. The 21-year-old had his jaw stitched and sat on the bench for the second half but did not return to the field. With a difficult month ahead, including matches against Hawthorn, West Coast, Richmond and Port Adelaide, GWS will be sweating on the Match Review Officer's adjudication on Cameron. It would not surprise if he was referred directly to the tribunal. 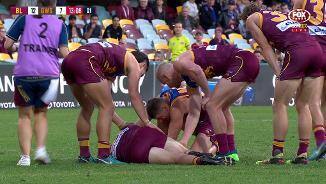 Cameron has a poor record, with 10 charges resulting in two suspensions, including being rubbed out for four weeks after breaking Lion Rhys Mathieson's jaw in the 2016 pre-season. Speaking to Fox Footy after the match, Cameron explained his side of things. "I just saw the ball coming in, I like to go the ball really hard," he said. "It was unfortunate I hit him in the head. I definitely didn't want to hurt him. I played the ball on merits." "Definitely didn't mean to hurt him." Cameron put the incident behind him to kick three goals and temporarily move alongside Ben Brown to lead the Coleman Medal race. The Lions were again valiant in defeat, but the Giants held them at arms' length for most of the night, making it three straight wins. 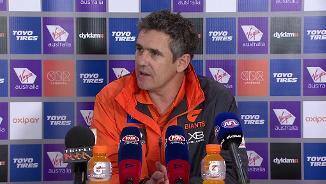 Giants coach Leon Cameron said he was pleased with the win but there was plenty to work on. 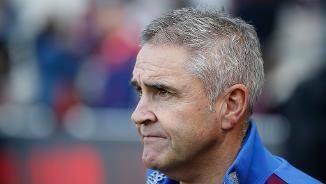 "To come away with a 27-point or 30-point win is really pleasing, but it was disappointing that (in) the last three or four minutes they kicked the last two or three (goals)," he said. "There was some good things, there was some bad things. We clearly let them go from one end of the ground to the other and our pressure wasn’t to the level it needed to be. 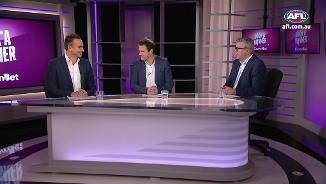 "Particularly after the last two weeks, the Gold Coast and the Adelaide game, I thought it was really good, but we need to obviously do a fair bit of work on that during the week." With Stephen Coniglio (26 disposals) back in the line-up, their all-star midfield was back to its best, led by the strong-running Josh Kelly (30 disposals and two goals), Lachie Whitfield (26) and Dylan Shiel (26). The defence also stood up well, thwarting many Lions forays, with Sam Taylor doing a fine job in keeping Eric Hipwood to three goals. 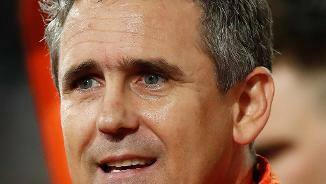 Without their All Australian contender Andrews, the Lions can hold their heads high. Coach Chris Fagan said he was proud of his team after also having to play without Darcy Gardiner (ankle) for about a quarter before he returned. "I liked the character of our players to hang in there," he said. "The effort was there again tonight. I thought our ball movement at times was fantastic." After watching the Giants stream to a 36-point lead early in the third quarter, the home team scrapped and clawed to within 15 points early in the last after a clever Allen Christensen finish. Daniel Rich (30 disposals) and Luke Hodge (30) – playing his best game for his new club – were magnificent in defeat. Hodge wound back the clock, not only marshalling the undermanned backline, but managing to climb high for a super second quarter grab and kick his first goal for his new club. 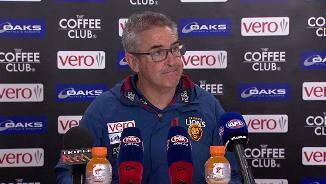 Brisbane Lions: Andrews was sick and sorry post-match and coach Chris Fagan said he would be assessed through the week. "I don't think he remembers too much about what happened," Fagan said. Darcy Gardiner hobbled off in the opening quarter with an ankle problem but returned with a hobble and eventually ran the game out strongly. Greater Western Sydney: No problems for the Giants, with Stephen Coniglio (26 touches) very strong on his return from concussion. 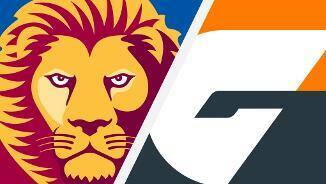 The Giants start a tough month of footy that could define their season with a home match against Hawthorn next Saturday night, while the Lions make the longest trip in the game to play Fremantle in Perth on Sunday afternoon. Reports: Jeremy Cameron reported for striking Harris Andrews in the first quarter.